This beautiful 8 plex is now available to rent. 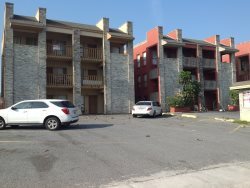 The first 2 floors have 4-2 bedroom, 2 bath condos, and the third floor has 2-3 bedroom, 3 bath condos. The property is about 1/2 block to the beach, and is close to shopping, dining, and the entertainment district. This condo is a 2 bedroom, 2 bath that will sleep 6 people. It is a second floor walk- up and has washer/ dryer, parking for 2 cars, and use of the shared pool. NO Phone. For larger groups rent several of the condos .